At 12 years old was a keen footballer. December 2015 she couldnt wait for the next season to start. Over Christmas Chloe started to experience back pain which gradually got worse until she could no longer walk properly. January 8 2016 Chloe was sedated to have a MRI. She awoke 11 hours later after surgery to be told she has Cancer. Ewings Sarcoma. A tumor located next to her spine. It wrapped around nerves and would need to be treated aggressively with Chemotherapy and Radiation Therapy. There was nothing else that could be done with surgery if Chloe was to walk again. Football was no longer a priority. Chloe spent on average 3 out of 4 weeks in hospital that year. During the 2015 part of the 2015/16 Hyundai A league season Chloe was a regular ball girl and volunteer at Western Sydney Wanderers home games. She became familiar with some of the players and naturally had her favourites. Becoming sick limited her access to matches and seeing the players who inspired her. Having friends within the club it was arranged for Chloe to be at one of the teams public recovery sessions. The team were not aware she would be there. Every team member made an effort to come over and talk to her. Not just say hello but to have a conversation. They talked about football, TV shows, movies, books, all things Chloe liked. They didnt mention her illness, they didnt say they were sorry, they didnt remind her she was sick. Thats Football. From then on Chloe’s medical team used the Wanderers to motivate Chloe through her treatment. She would convince the Doctors to schedule her treatments around the teams home games arguing that they didnt win if she was in hospital. Even if she could not make it to the game, she had to be out of hospital. Chloe became a regular face at the teams recovery sessions and the Wanderers became regular faces in the hospital dropping in to visit if she wasnt well enough to get out. In 2016 the Wanderers finished runners up. Chloe was told she is Cancer free. Move forward to the 2017/18 season. Players had come and gone but the feeling remained the same - Chloe was welcome as part of the WSW Football Family. The team wasnt going so well. It had been weeks since their last win at home. Fans were restless with only the dedicated staying past the final whistle to gather on the fence for a photo or a high 5. Chloe would always stay and make sure some if not all the players noticed her support. The player would walk the boundry, pose for the photos and politely smile before moving into the changroom for the dreaded “talk”. January 2018. WSW defeated Melbourn City 2-1 at ANZ Stadium. The season wasnt over. Even with the win fan numbers were down. Chloe stayed, this week on the fence. The players were so different. The players were extatic. Rather than just smiling and waving they were hugging and kissing people in the crowd, including Chloe. It was like they were drunk on the win. Recovery that week was also different. Chloe noticed the staff relaxed a little, the players were alot more talkative. 2 in particular. Chloe talked to Michael Thwaite and Josh Risdon about how different everyone was. They replied in unison “Thats Football”. Returning to play football is no longer an option. Chloe has found another way to be involved. Photography. Chloe showed an interest and once again the Wanderers jumped on board. One of the clubs photographers volunteered to mentor Chloe. To help her with money cant buy tips, tricks and also opportunities. Chloe sat pitch side with the official photographers for the last 5 matches of the season. 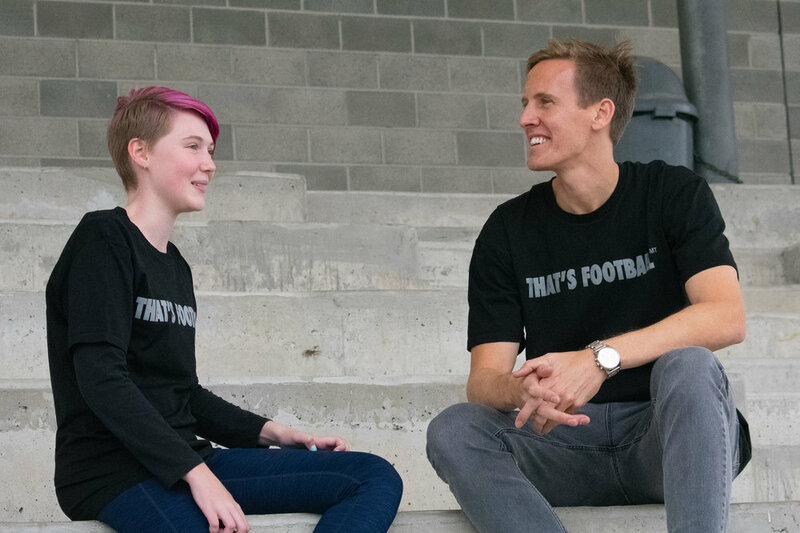 Jeff, Eric and George took Chloe under their collective wing and introduced her to professional football from behind the camera. Chloe caught a few great shots and was delighted to see players use her photos on their social media pages. Some players have moved on to different countries, A league clubs or even retired. Many stay in touch and are still talked about often. They will always remain friends. Thats Football. Chloe is still recovering. These days she is in the pool on recovery day swimming laps along side those who inspired her. There is no longer a favourite player, well maybe one, the team has gone from inspirational strangers to her friends. She never critisises a match or asks for autographs or photos - thats not what friends do. WSW are family and continue to play an enormous role in Chloe’s life. Who knows what 2018/19 season will offer. A new coach. A new squad. We know Chloe will be at recovery, swimming along side the team, at home games and taking photos whenever she can. Win, lose or draw. Thats Football. Copyright 2019 THAT'S FOOTBALL PTY LTD. All rights reserved.